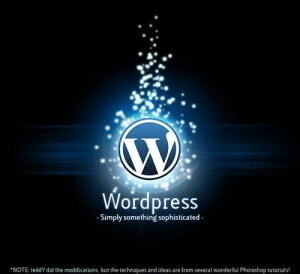 WordPress started out as a simple blogging platform. It was free to anyone who wanted to set up a personal or business blog. Its application was such that blogs could be hosted on WordPress itself or integrated into existing websites. These days, it’s also used as a content management system (CMS), which means it’s a bona fide platform on which to build websites. It also means that with just a little bit of technical know-how, anyone can set up a website. Even those without a background in web development and design can figure out what to do, especially as WordPress and a number of other sites provide tutorials on how to manage the trickier aspects. We’ll look at it from a blogger’s point of view. It’s strongly suggested that before you create a blog you have an idea of what you want to achieve. For example, do you want your blog to be a kind of online diary full of random ramblings for other people to read or do you want to share your expert knowledge on macramé, maybe you have business tips for telephone operators or perhaps you want to satirise politicians or comment on fashion. When it comes to blogging, the world is the proverbial oyster. Your web developer would have given you a username and password as well as a URL where you can login. Once you have logged in for the first time, it’s a good idea to start with the general settings, which include a brief description and uploading a blog picture or icon. Then it’s time to hit the themes. 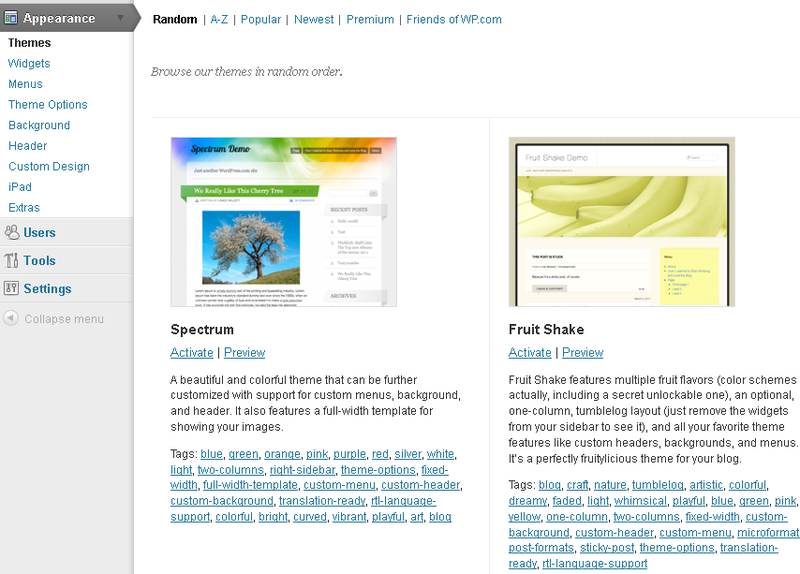 There are a number of free WordPress themes available on the site. But other sites also specialise in free WordPress themes. You can buy a theme or you can have one professionally made. It all depends on how much you’re willing to spend. Quality doesn’t come into it because the free themes rival the bought ones in terms of appearance and, generally, they allow a degree of customisation – colours and whatnot. You can also decide whether you want sidebars or not, how you want to set up your tabs, whether to include a blogroll, etc. Note that you don’t need to do all of this at once. WordPress will give you a default theme so that you can start blogging immediately. You can take your time choosing your theme and getting all of your settings just right. Here you’ll find shortcuts to everything you need to make sure your blog looks the way you want it to. Themes – which were briefly mentioned above. Widgets determine what will appear on your blog. If you want a blogroll, this is where you pick it, or a tag cloud or live Twitter feeds. They’re easy to add or remove as is your want. All you have to do is click and drag. Theme options allow you to decide if you want a left or right content side or whether you want a side bar at all. You can also pick and choose colour schemes. Options only extend as far your chosen theme allows. Background enables you to pick a background image. You need to preview it to ensure that it doesn’t clash with your theme. Having a background image isn’t essential. Header: themes usually allow you to change the image used in the header section. Again, this isn’t necessary but it does make your blog feel more like your own. Custom design is a paid for application that lets you change things like the font. 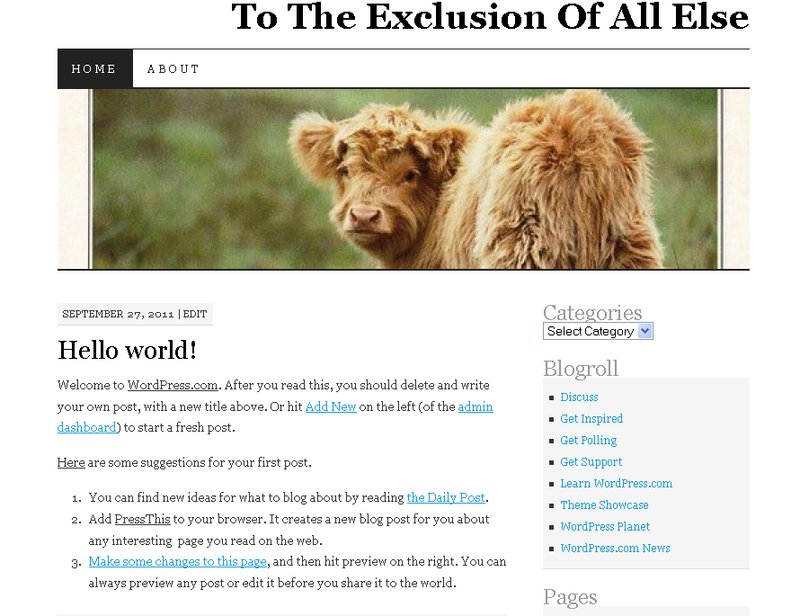 As the blog creator and owner you can allow other people access to the backend of your blog. You can allow them administrator rights, which is not recommended unless you trust them absolutely not to publish junk (or worse) and mess around with your settings. Otherwise you can give them restricted access as contributors or authors. This enables things like Google Webmaster Tools and Bing Webmaster Tools. As it says, it enables you to set formatting, like converting symbols (: )) into emoticons and cropping blog posts to appear on your landing page as opposed to showing the full thing. We recommend cropping posts otherwise you don’t give your visitors much incentive to navigate beyond the landing page. You can also decide how you want to manage comments, the maximum size of images, and privacy – as in whether or not you want search engines to index the site, which you definitely do want. You can choose which sharing buttons you want to appear on your posts – Google+1, StumbleUpon, Twitter, Facebook and Digg are some suggestions. Fool around with all the options available. More often than not you can preview the changes you make and if you don’t like them you don’t have to have them. Now that you’ve got your blog looking more or less as you want it, you can start with the writing. Before you leap into writing posts, consider whether you want to add a couple of static pages to the site. The About page is default on all WordPress blogs. You can get rid of it if you want to but it’s a good idea to keep it so that your readers will know a little something about you (as the page suggests). But it’s not recommended because it’s boring and gives the impression that you don’t care. I like puppies and kittens and candy floss and think that baby blue is the best colour in the world. My hobbies are chasing rainbows and pots of gold. Read my blog if you like a bit of fluff. Jane Smith is an auditor who considers her calculator her best friend and likes to crunch the numbers on nutritional labels in her spare time. Her favourite TV show is Walking with Dinosaurs and her favourite read is the Encyclopaedia Britannica. She wants to share her passion for numbers and try to bring order to the world. Or absolutely anything you like. You can add other pages too if you like. For instance, if you’re into farming, you could have a page each for Dairy, Sheep, Chickens, Maize, Beans, etc. WordPress kicks off with a standard Hello World page. You will want to change it because it looks careless if you don’t. Try to make your first post something interesting. Open with a bang, if you will. While it’s not essential to add images to your posts, pictures provide visual stimulation and entice readers to carry on reading. You can place images anywhere you like, e.g. upper left, lower right, smack in the middle. Important: Don’t use images that are copyright protected. This will get you into a lot of trouble. If you don’t have images of your own to upload (photos you’ve taken or designs you’ve put together with Photoshop) you’ll have to use stock photography from sites like Wikipedia Commons, Flickr and Stock.xchng. You’re looking for images for commercial use, this means they need to license for copy, distribution or modification under any of the Creative Commons Licenses or the GNU Free Documentation License or, even better, released into the Public Domain. It’s also possible to use Google Images to find images, so long as you use the Advanced Search option and select the appropriate button in the usage rights section; commercial use is your best bet. From the Dashboard click on post. Now write to your heart’s content. You can write directly into WordPress or write a blog in a Word or Google Doc and copy and paste. Occasionally WordPress changes the formatting of blogs copied directly from MS Word – the punctuation goes wrong. If this happens you can click the “Show/Hide kitchen sink” icon and then click “Paste from Word”. Alternatively you could always copy and paste from word into Notepad and then into WordPress. As with Word Docs, you can format the font as you like it, inserting Bold, Italics and Underlining as you please. If you’re technically minded and work in HTML you can click the “HTML” tab and lose yourself in your markup language. Going back to visual will show you if you’ve got all your HTML right. When you’re done don’t forget to give it a category and a tag. At the very least uncheck the uncategorised box. Then preview your changes so you can see what it’ll look like when it’s live and if you’re happy click Publish, or in this case Update. Which is where you paste the URL. It’s a good idea to tick the “Open link in a new window/tab” button because having a new page open on top of an existing one can be annoying. Now, you can add the image. The easiest way is to pick roughly where you want it, at the top right or left, centre, bottom, wherever, and place your cursor there. The one that looks like a camera over a music note is the one you want. You can hover your mouse over these icons they’ll tell you what they do, like add video, audio, media or polls. If you’ve saved the image to your computer you can Select Files. If you’re going to simply use the URL from the source you click “From URL” and if the image is already stored in your blog’s library you click “Media Library”. In the example we’ve saved the image as a file on the computer. Once we’ve selected the image we are then presented with a couple of options. We can change the title (which defaults to the file name), add alternative text, add a caption, add a description and add a link to the source. Note that sometimes adding a caption can make aligning your image precisely where you want it difficult. It does something to the line alignment and spacing. As with the occasional font formatting problems encountered when copying and pasting from Word, it’s just something that WordPress does. These problems can also crop up depending on the browser you use. In our experience, Firefox delivers the best results. Make certain of your alignment and image size. Remember that the bigger the image – pixel-wise – the longer your page will take to load. Keep images as small as possible. When you’re done click “Insert into post”. Alternatively you can click “Save changes” and it will go to the gallery where you can retrieve when you’re ready to use it. If you want to upload a video you’ll have to purchase the video upgrade, but the principle is the same as adding an image. 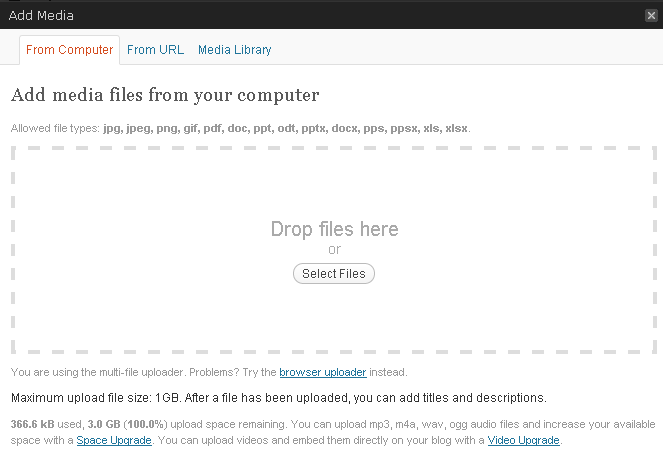 In fact, the same principle applies to uploading anything from the icons presented. WordPress is achingly simple to use, it prompts you every step of the way. 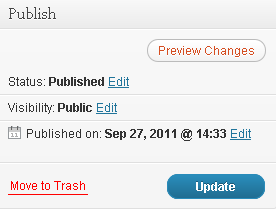 Don’t forget to preview your changes before publishing the page. You even have options when you get down to the publishing process. You can change the status of your blog from Published to Pending Review or Draft. You can change visibility from Public to Private. And you can schedule your post to go live at a specific date. This is very handy if you upload a number of blogs in one day but don’t want them to go live on the same day. You can stagger them over a couple of hours, days and even months if you so choose. You can edit your blogs any time you want and “Update” the changes or delete your post if you’re not happy with any of it. You’ll see that the blog is set up so that only teasers of each post are shown. It’s also got its widgets set up to show most recent posts and categories and even a hotel search – for easy site navigation. 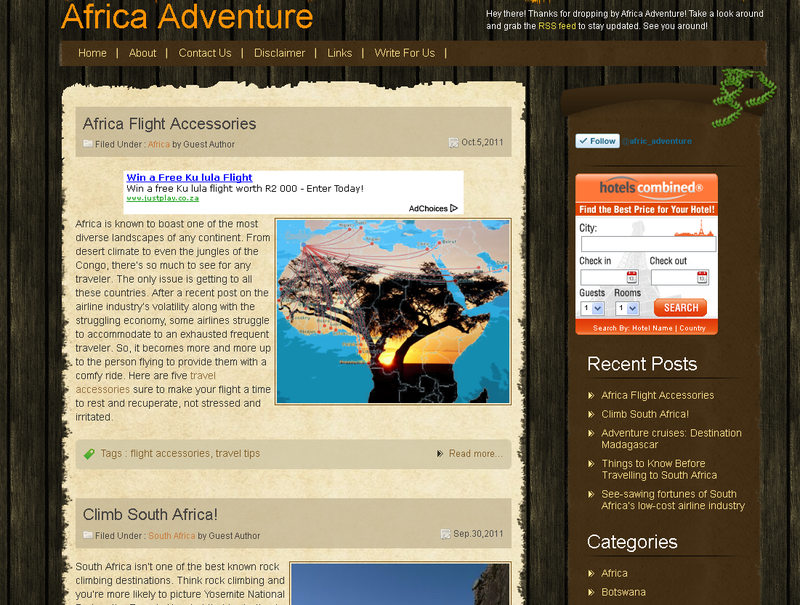 Just beneath the title – Africa Adventure – you’ll see tabs for the different pages, Home, About, Contact Us, Disclaimer, etc. It’s always a good idea to have a disclaimer on your blog, just in case. Disclaimer templates are available for free online. Adding a new page is much the same as adding a new post, except that you’ll choose “Pages” from your Dashboard. Click “Add New” and you’re good to go. Give your page an appropriate title, like “Terms and Conditions” or “FAQs”. Add your text to the body, add images as you please and Bob’s your uncle. You might want to disable comments on some pages. Your contact page, for instance, isn’t designed to generate conversation. To disable comments click “Screen Options” in the top right corner. Tick or untick “Allow comments”. When you allow comments you don’t want to allow them willy nilly. You need to maintain control over what people say on your blog. To do this you need to choose “Comments” from your Dashboard. The rows in yellow need approval; the ones in grey have been approved. Your options are to Approve, Reply, Quick Edit, Edit, Spam, or Trash the comment. Be judicious in the comments you approve because many people are just looking for a link back to their site. They’ll say something random like, “Thanks for the interesting information” or “Great post, really interesting but if you want to learn more about photobombing the president go to www.iheartphotobombs.com. If there are valid comments, approve and reply to them. Make your reply worthwhile, not just, “Cool, thanks” or “Sure do appreciate your point of view”. Use your editing powers with care. People don’t like it if you mess with what they’ve said. Only edit if the comment contains profanity and you have rules against that. Resist the temptation to correct spelling and punctuation. Remember that a blog is like a child (or a pet, or a plant) it needs attention and care if it’s to thrive. Add posts on a regular basis and don’t neglect your comments. We hope this has been helpful and if you need any further assistance please don’t hesitate to contact us. Great guide to WordPress. Thank you! Thanks for sharing. Great blog! What always bothers me is when people actually pay somebody a fair amount of money to set something simple like this up.